I am a recent NPR convert and like all newbie converts I am right now totally hooked on, though only during my morning commute when my li’l one is not there in her car seat voicing her opinions which are far more important than those aired on NPR. So I was pleasantly surprised this Monday morning, when I heard them saying how millions of Hindus celebrated Deepavali over the weekend. Next thing I hear is the correspondent saying that Ganges is a very sacred river and then a correspondent from Rishikesh, India is waxing eloquently about the river, describing his experience as he went on a rubber dingy on the river. It was very nice to hear them not talking about the Ganga being polluted etc. and instead stressing on it’s greatness. I have a pretty close association with the river Ganga as most of the places we lived as a kid were on its banks. And this mention sent a shiver of happiness down my spine, and I felt how I miss my country and how a simple mention of its river made me all proud. Would my daughter feel the same hearing about Hudson River, ok at least Niagara on AkashVani? On another note, if we are talking of the river, can fish be far behind? Bengalis being pretty fishy folks (pun intended) have thought of hazaar permutation & combination of cooking fish. 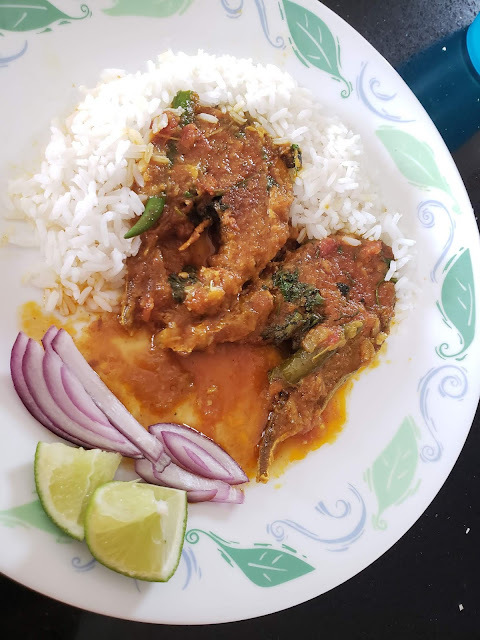 Today I thought of making Fish Kalia for dinner. This is a gravy based dish usually made with fish like Rui(Rohu) or Katla. Fish Kalia is a more richer and spicier dish than our regular maacher jhol.In a Kalia, the gravy base is made with onion-ginger and garlic paste and the dish is made richer with use of ghee and garam masala. You can adjust the spices to your taste and palate. 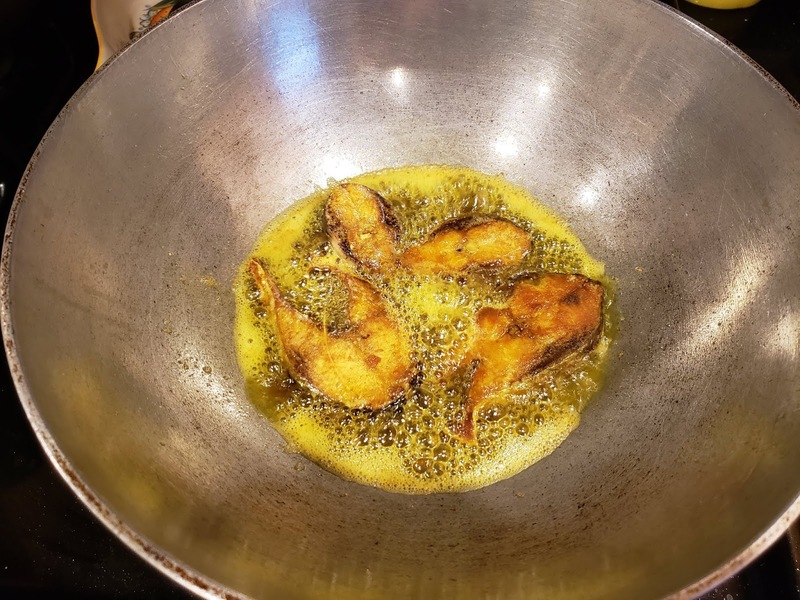 This is appropriate for both lunch and dinner and is also popular as a dish that a Bengali family would serve their guests on special occasions. I made this with Red Snapper this time and it was really very tasty. I have had Red Snapper at Thai Places and one of my friend’s place but this was my first try and it turned out great. It can also be made fish like striped bass, tilapia amd shad. Ok, an apology is due here, as I do not cook by measure, & I kind of throw in ingredients according to andaaz, so feel free to innovate. I will try to be more specific with my measurements while I cook now. 2 mid size Red Snapper ~ each cut into 4 steak like pieces (didn’t use the fish head). Total 8 fish pieces. You can use fish like Rohu(Rui) or Katla for this or Tilapia, Shad etc cut in steak pieces. 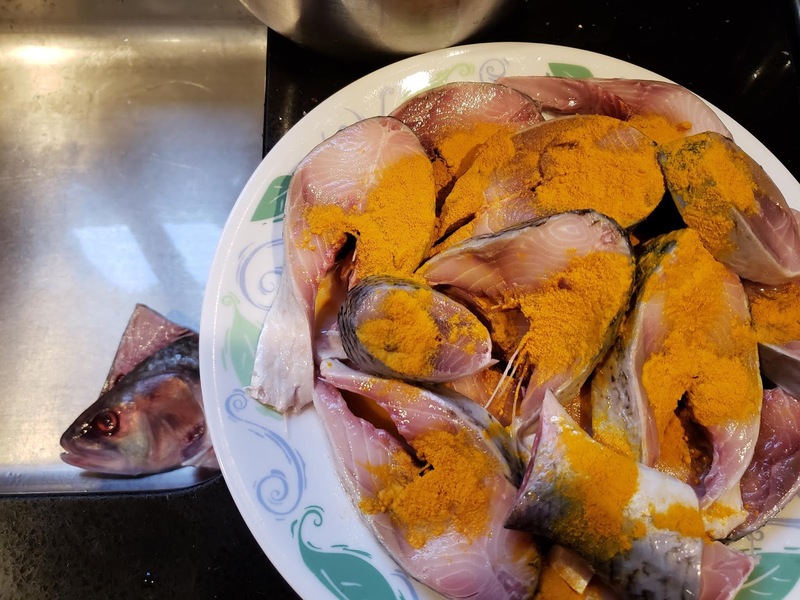 Wash the fish pieces in warm water, pat dry & and mix them with a teaspoon of turmeric powder and salt. Grind onion and garlic to a paste. It is better if you can fry the onion + garlic until they are translucent and then make a paste. Fry the fish in hot oil till it turns golden on both sides, kind of deep fry. Heat oil in Kadai/Frying Pan. Lightly fry the potatoes, remove and keep aside. As soon as they start sputtering add the onion & garlic paste. Add green chilies. When the onion has turned reddish brown add the chopped tomatoes. You can also puree the tomato and add. Saute till they become a fine pulp and you see oil separating from the paste. Mix the Jeera Powder, Dhania Powder and the grated ginger with yogurt(instead of water) to make a paste and add this masala.Cook this masala for about 2 minutes till you see the oil seeping out of the edges. Add a pinch of turmeric powder and water. You don’t want this gravy to be very watery so add water with caution.About 2 cups of warm water should be fine. When the gravy comes to a boil and the potatoes are almost done(not fully boiled yet) add the fish pieces. Cook for a few more minutes till the potatoes are cooked and you are done. Garnish with fresh coriander leaves. The gravy is best enjoyed with white rice. You can also try this dish with other fish available in American stores like Tilapia. 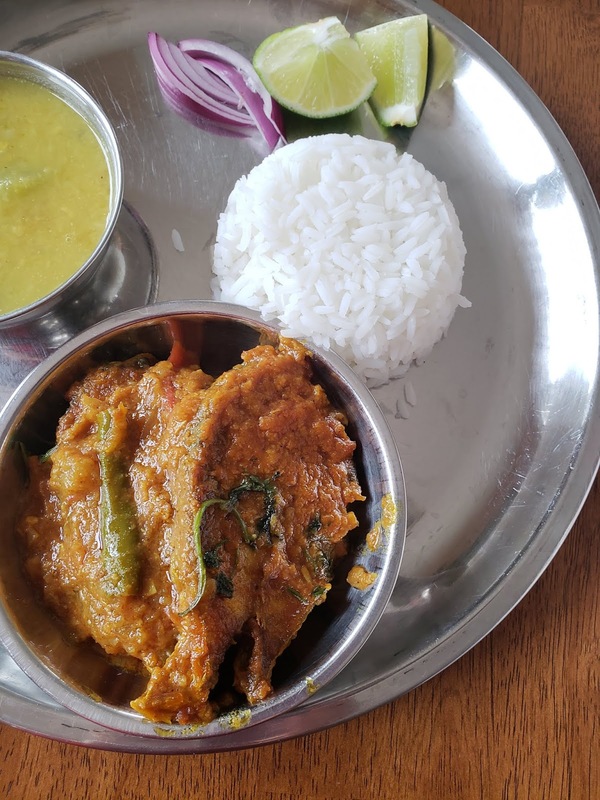 Mandira of Ahaar has a recipe of the same dish with CatFish. Check it out here. Trivia:The drink we know as Bloody Mary was originally called Red Snapper. Correct me if I am wrong !!! I know what you mean when you say that just the mention of something Indian makes you feel proud. I usually sit up and take notice if I hear a name that sounds remotely Indian on TV. From another NPR fan and food enthusiast - great blog! I am adding you to my blog subscriptions, so looking forward to more delectable delights. I used Carp instead of Rohu/Rui for Maacher Jhaal and it is also a fresh water fish so the taste is comparable. You are from B'lore right ? B'lore had a good fish market near Yashwantpur which we sometimes visited.Do you eat fish ? Ish ar Ilish mone karash na (I guess it's ok to say tui). I have a bangladeshi fish seller here who gets very good Padma'r Ilish. never tried Carp here, shall try that next. I dont eat fish, but look at recipes that I can incorporate iwth chicken etc. Great blog, some mishti Doi wud be great! 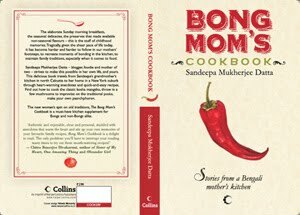 Macher Kali looks delicious sandeepa, I want some... I have tried making it will whole catfish and tastes pretty good. "Would my daughter feel the same hearing about Hudson River, ok at least Niagara on AkashVani? "- I really loved this bit. I wanted to try atleast 10 diff ways of cooking Fish .. so have been surfing blog to blog in search of somehting really gr8 !! My hubby loves fish ! I tired out this out 2 times once with red snapper and next with Catfish ! both the times we loved the final outcome.. i just changed it a bit, added a lil coconut 1 spoon to give it that "kerela" touch ! and it sure did taste gr8 !! this is definetly for "keeps "
I tried making this dish earlier but each time it turned out to be such a disaster!! I mustered up a lot of courage and this weekend tried your recipe with some rui maach...came out almost perfect....much to my delight and my hubby's tooo who commented "ak dom biyer baarir moto hoyeche kaalia ta". Thank you thank you...so much for helping me get over my "kaalia fear"
I like this recipe..I usually make a few variations though...its nice to see people clinging to there roots even when miles away..thanks to us cooking enthusiasts..other wise these recipes would be long gone. Hi Sandeepa,Its Jayashree. Today I made this dish.It comes out very good, my husband said.Because I dnt like fish.So keep posting more fish recipes. 1. How much sugar does one add? 2. What do we do with green chillies? How do we cut them and when do we add them?